This is one book we brought with us to Florence. We particularly like the background information on different foods and wine and the listings of different markets and stores to buy from. It is in this book that we first read about the famous schiacciata. 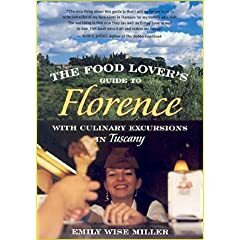 11/30/07 - I just reread the preface to the 2nd edition and boy does the author have it right about Florentines and the fact they are always talking about food. The other day we were walking on the Ponte Vecchio and I overheard a poliziotta on her cell phone giving instructions on how her lunch should be prepared.